I’m on holiday on the North Yorkshire Coast this weekend, and of course no coastal holiday is complete without a trip to the beach. 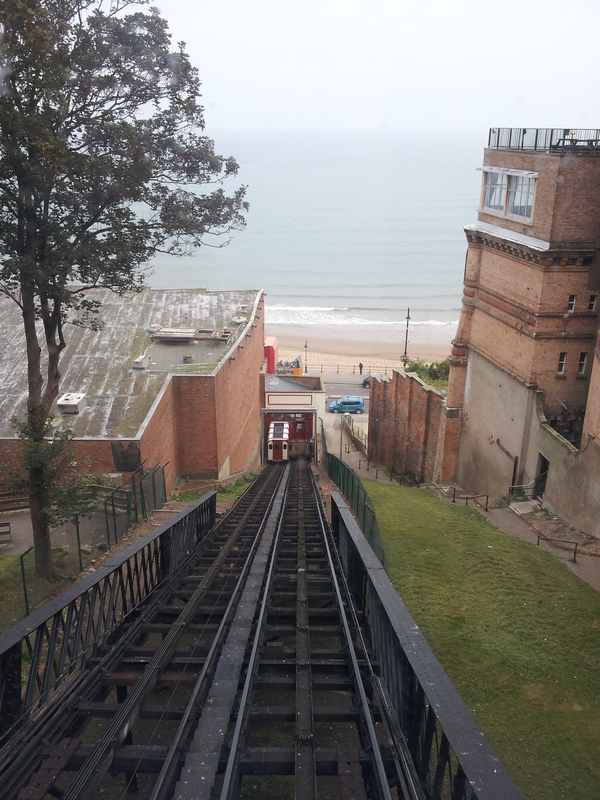 In Scarborough, I found the most unusual way to get to the beach I’ve ever seen! 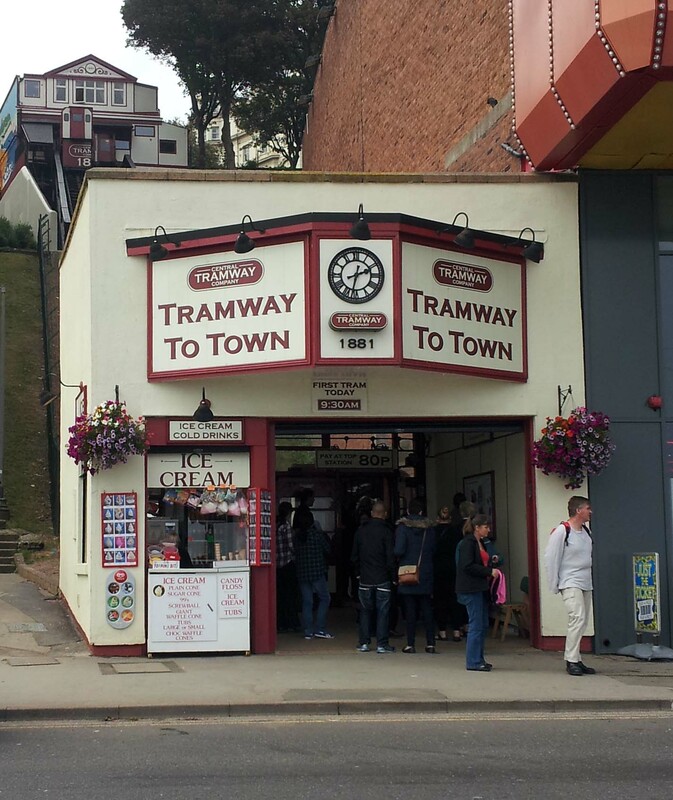 The town centre is high above the beach, and when the town was in its heyday as an Edwardian holiday resort, some bright spark had the idea of saving people from the steep walk up and down to the beach by building a tram. 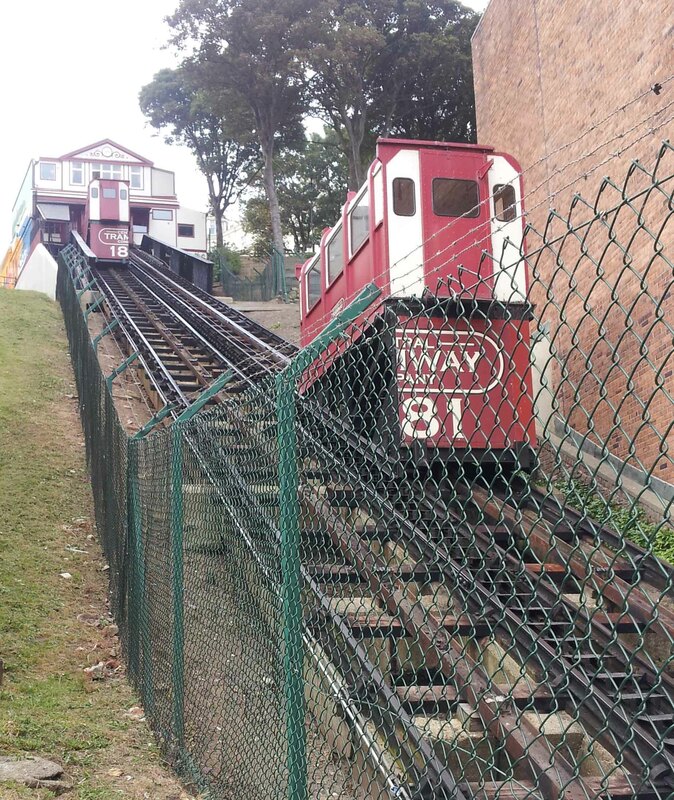 It’s called a tram, but it looks more like a funicular railway to me. There are two carriages, one goes up and one down so the weights cancel each other out, overlapping halfway down the track. 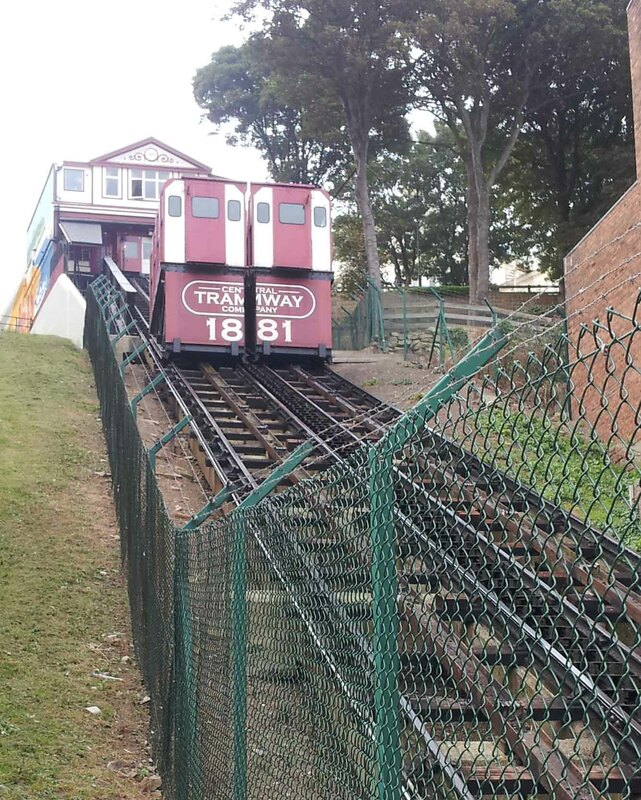 But it certainly saved the effort of climbing the hill. 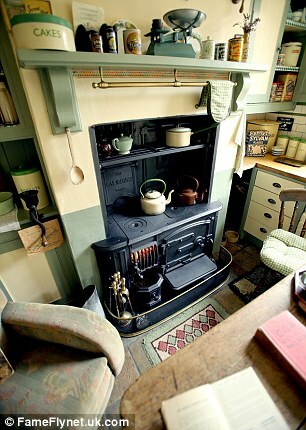 As vintage becomes more mainstream, it’s not unusual to see elements of vintage/retro in peoples’ clothes or in their homes. It’s a habit I follow myself, and I’m very pleased with the elements of vintage that I’ve incorporated into my daily life. 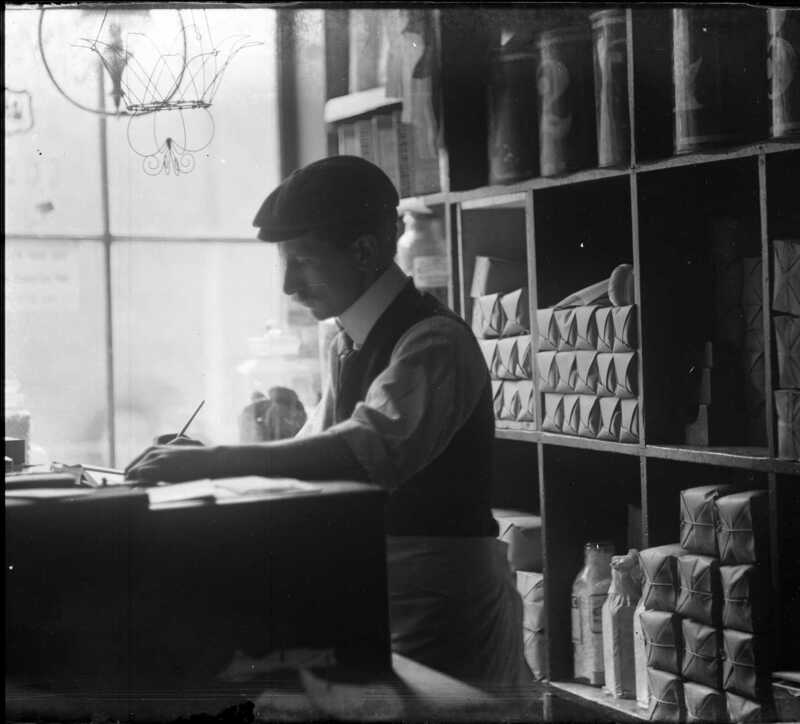 At the same time, I am not sure that I could ever embrace a fully vintage lifestyle – for a start, what decade to choose? Home-wise I mix the clean lines of 20’s Art Deco with kitsch 50’s kitchenalia, and style-wise, my taste inclines to the the thirties, but my figure best suits the forties and my wardrobe still has items I wore in the 80s. So I am full of admiration for those people who have the dedication/obsession to set their whole life in a single decade, and to make sure that it is reflected in every element of their personal life. His dedication to this way of life includes getting up at 4am to light his vintage range, according to the Daily Mail. Now that’s dedication to the way of life! 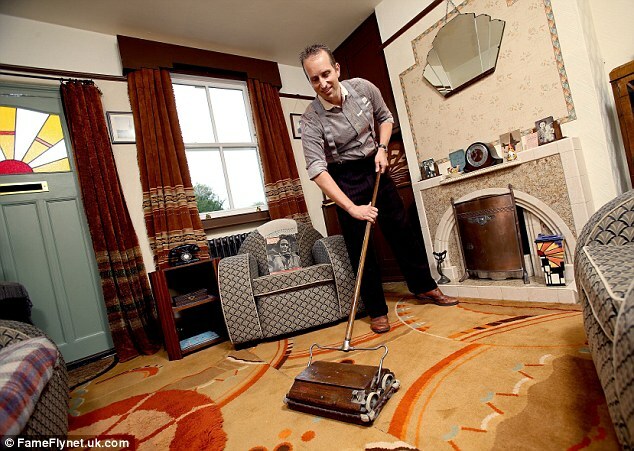 A woman recently featured in the press, credits living as if in the fifties with saving her marriage! While as a good feminist, I’m not sure I agree with all the views in the article, I have to admire the dedication that this couple have given to collecting and living with period appropriate items. One thing I do take away from this, is that as more and more articles like this appear in the media, vintage may become more mainstream and lose some of its cachet as an alternative lifestyle. Is this good or bad? I don’t know. I welcome anything that establishes the value of original vintage, rather than some pastiche of memories watered down and made in China – now available in a chain store near you. But at the same time, does it devalue the lifestyle? As its still summer, although the weather here feels more like autumn, here’s a photo to reflect the season. This lovely lady is obviously proud of her knitted swim suit. I do like vintage clothes. But I’ve never really had the confidence to wear full out vintage on a day to day basis, not like the redoubtable vintage blogger Jessica Cangiano at Chronically Vintage. 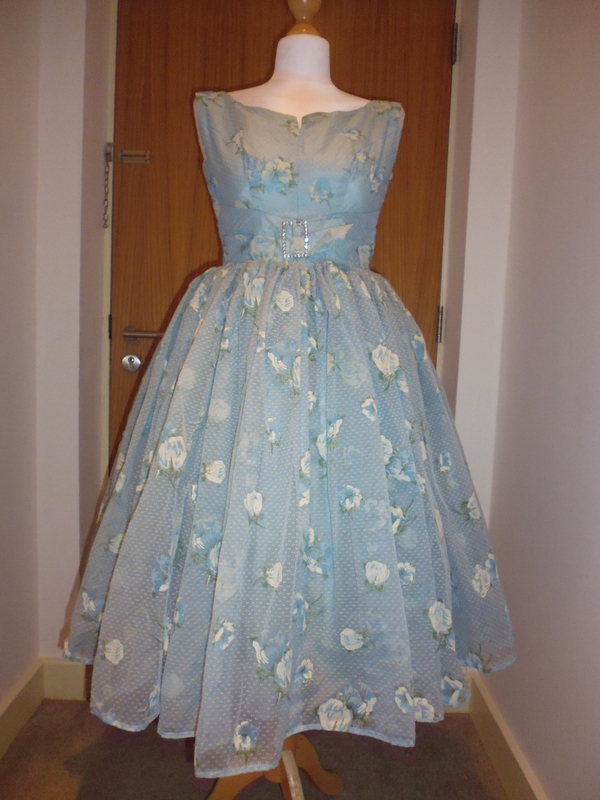 I found it in the bottom of a mixed box of old clothes:- mainly Crimpline and Bri-Nylon – certainly nothing to write home about, but the sight of this classic 50s Prom dress got me very excited! 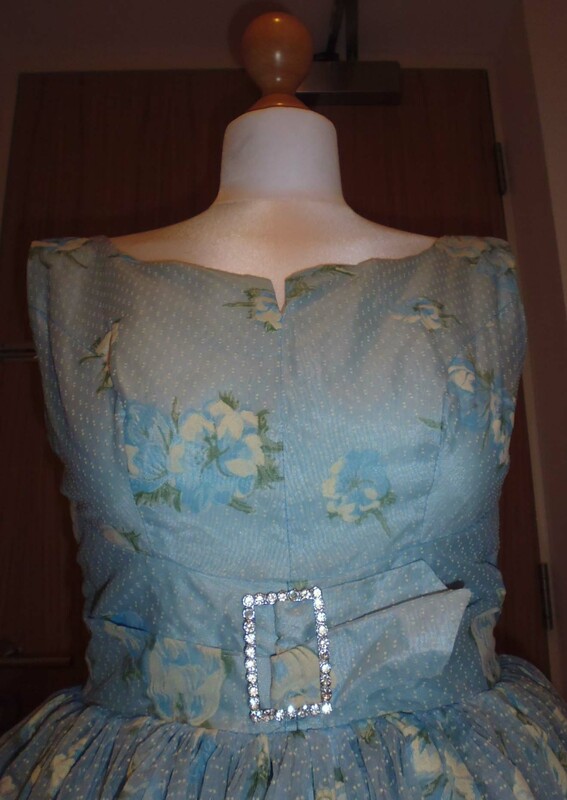 I love the full skirt, and the faux belt with a diamante buckle. 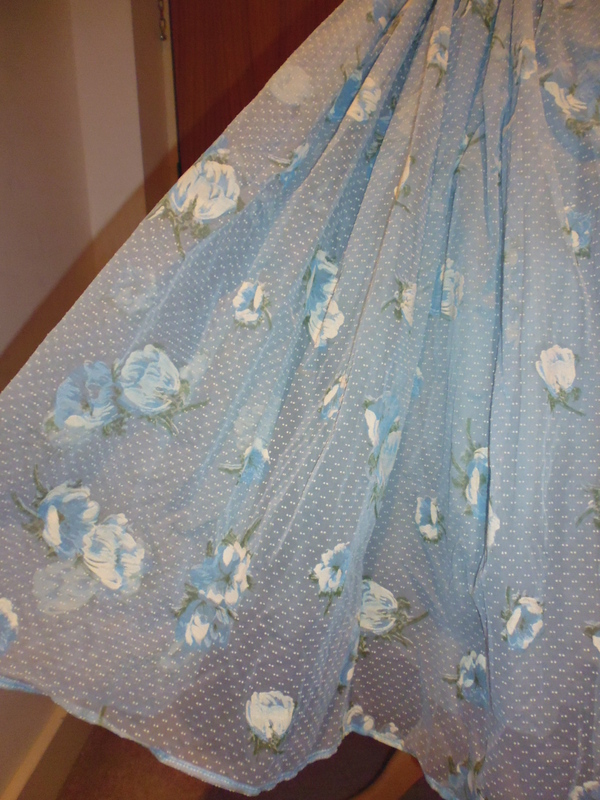 There was an underskirt of a stiff paper-like material to make the skirt stand out. When I found it, it was wrinkled and rather grubby. Washing it was scary, as I was scared of damaging the ‘flock’ effect of the pattern and I wasn’t sure how the underskirt and buckle would react to getting wet. 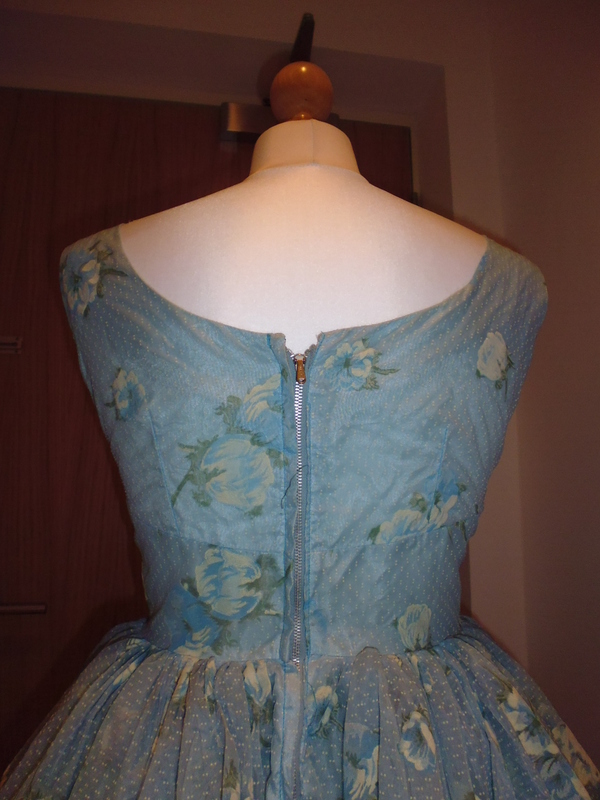 In the end, I sealed the buckle inside a plastic bag and turned the dress inside out so the top layers of the skirt went over the bodice and the underskirt could rest on my shoulder while I washed the fabric parts. But, as you can see, it turned out OK. However, sadly, it was just a tiny bit smaller that I ever have hope of slimming down to, so my dreams of wearing it to some unspecified future occasion have been dashed. But it’s not the end of the world. 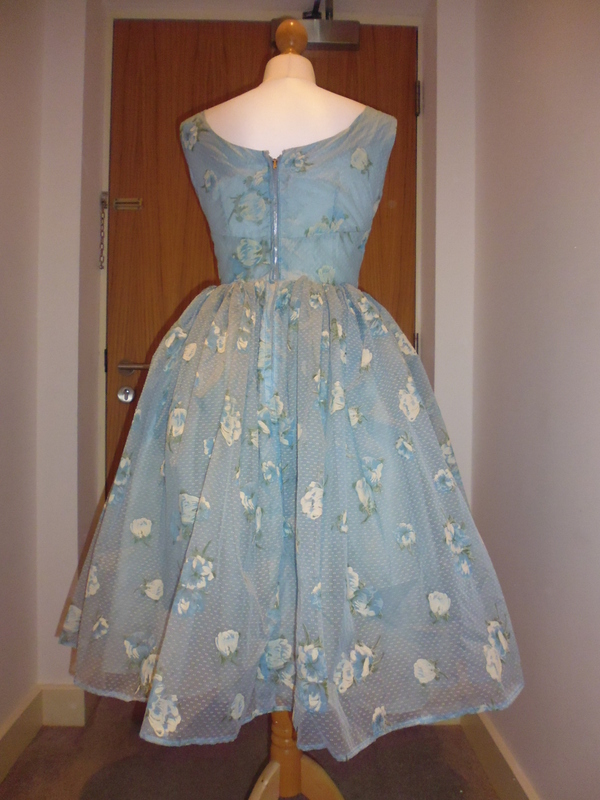 It’s gone to be a bridesmaid’s dress at a vintage wedding so will no doubt get much more admiration than it would stored in my wardrobe. 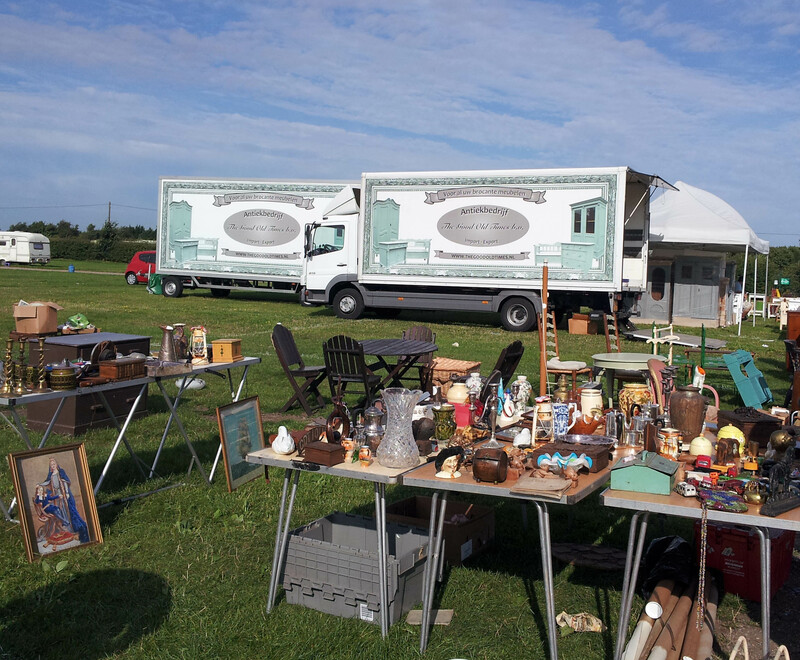 Here’s a selection of vintage events taking place during September. I can’t recommend any of them personally, but would love to go to all of them. If you do go, let us know how you got on and if you recommend for next year! Please check details and directions on their websites for up to date information. 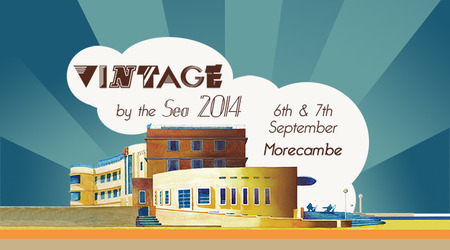 Vintage By the Sea, led by Wayne, Gerardine and Jack Hemingway and the Vintage Festival team, is to return to Morecambe for a second year this September. For one glamorous weekend the music, fashion, film, art, design and dance from the 1920s to the 1990s that has made Britain the world’s creative and cultural hot bed is celebrated. Following a successful sell out one-day event in 2013 this year we’re back for a weekend extravaganza. Whether your thing is swing, rockabilly, mod, soul, funk, disco, ska, film, art or design – or if you just want to dress up and get an authentic makeover for a day, the Vintage by the Sea Festival is a sensual delight, a big dressing-up box, a collector’s dream and a joyous creative feast for all ages. The fantastic setting of Morecambe’s seafront will provide the backdrop and be transformed into a multi-venue playground where, visitors can ‘learn the dances’, take in specially curated live performances, exclusive DJ sets, see evocative fashion, brilliantly conceived food and cocktails, ogle over beautiful vintage vehicles or take advantage of the decade specific hair and beauty makeovers and all the wonderful vintage shopping on offer. 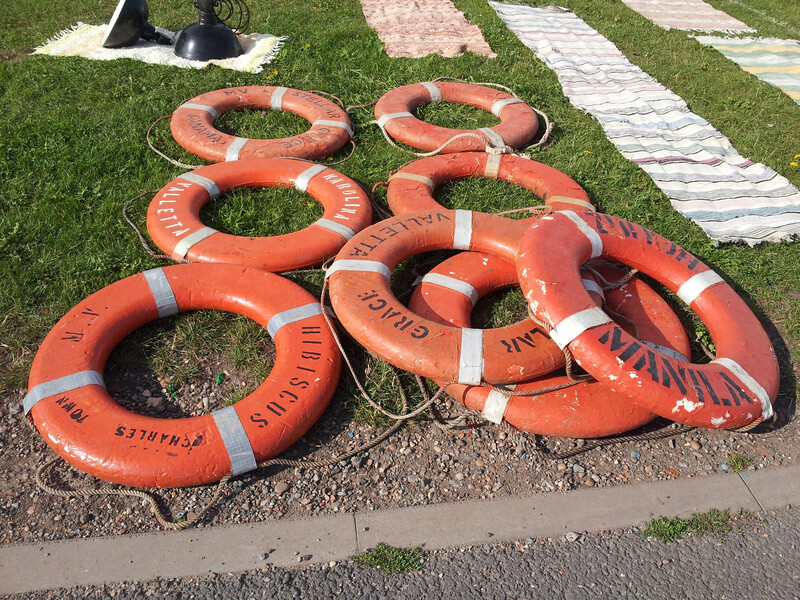 Fancy a vintage themed day at the seaside? Join over 300 surfers – many in vintage costumes and/or belly boards at the World Belly Boarding Championship. There is evidence of surfing in the UK in the very early 1900s, but it became a popular beach activity in Cornwall and Devon at the end of World War I. A mixture of wealthy Brits travelling to Hawaii & learning to surf, and soldiers chatting to Commonwealth surfers in the trenches combined to create something quintessentially British. A cup of tea, a cucumber sandwich and a spot of jolly good surf riding in the rolling Atlantic breakers became a must do activity for hundreds of men and women. 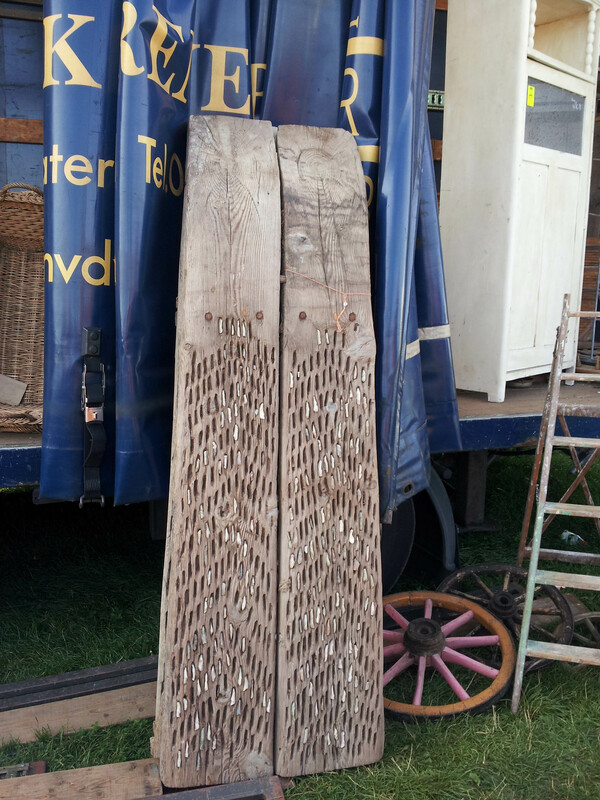 Their equipment ranged from modified coffin lids to ‘Crest Riders’ made from ply with a kick in the nose. Bellyboarding bloomed again after the Second World War as Brits returned to the beaches in their droves, and many thousands of bellyboards were made in the 1950s and 60s to service the growing demand. 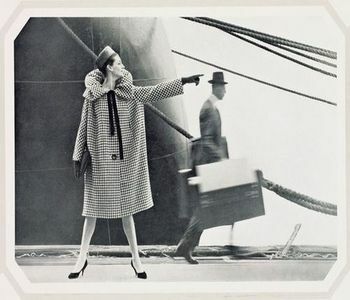 To celebrate London Fashion Week, Clerkenwell Vintage Fashion Fair returns in September with The Vintage Collections. Our highly regarded vendors have sourced some of the key iconic looks from different eras to illustrate the enduring allure of vintage fashion. Come and shop for pieces that don’t merely reference an era but are actually part of it. Over the last five years, the fair has become an essential diary date for leading fashion industry figures to attend, with the hall filling up as quickly as any catwalk show. International fashion editors, major fashion house design teams, celebrity stylists and models continue to return to source rare pieces to wear and keep them ahead of the pack or to reference in their own collections they are designing. The fair has also had an increased relevance to costume designers who are seeking original pieces, prints or weaves to add authenticity to their creations for film and stage. So come and rub shoulders with industry insiders during London’s most celebrated event, discover more about vintage fashion & style, get inspired and soak up the atmosphere whilst perusing the plethora of amazing stock! This September expect our tea room to once more play host to to jazz chanteuses and of course serve delicious tea & cake to revive weary shoppers. 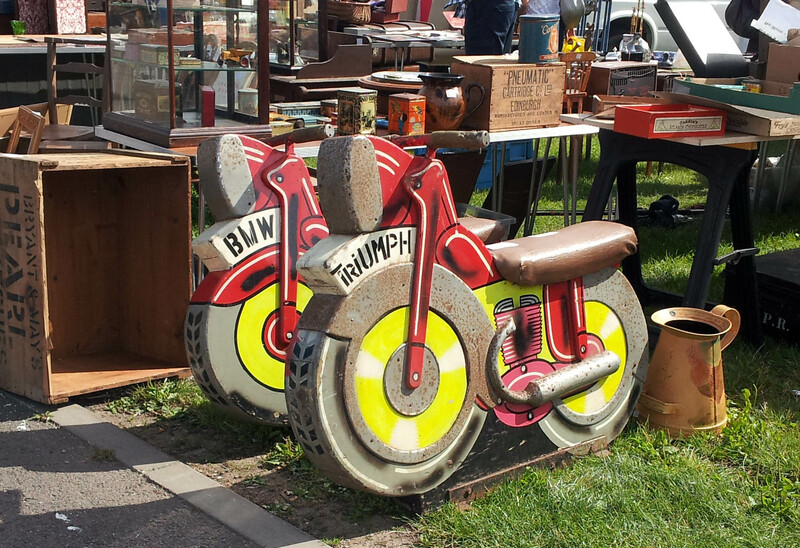 With over 100 vintage vehicles and traders operating from the boot of their vintage vehicles lining up, it will be a veritable treasure trove for vintage shoppers, collectors, vinyl lovers and petrol heads alike! While many of the larger events focus on Americana, Chatham Historic Dockyard’s Salute to the Forties is British through and through. Bordering on a slice of living history, the weekend is a family event, and while the audience is less likely to dress up than at some events, it still has the feel of a festival. Chatham Dockyard is a fitting backdrop for a dose of the Blitz spirit. Visitors can watch military vehicles cruising by, Spitfires flying overhead and a steam train trundling past the main stage. There is a range of music, in several locations, and the mood is cosy wartime knees-up, complete with Dad’s Army Home Guard re-enactors, Vera Lynn singalongs, Max Miller-style comedians and bunting galore to keep spirits going for the duration. 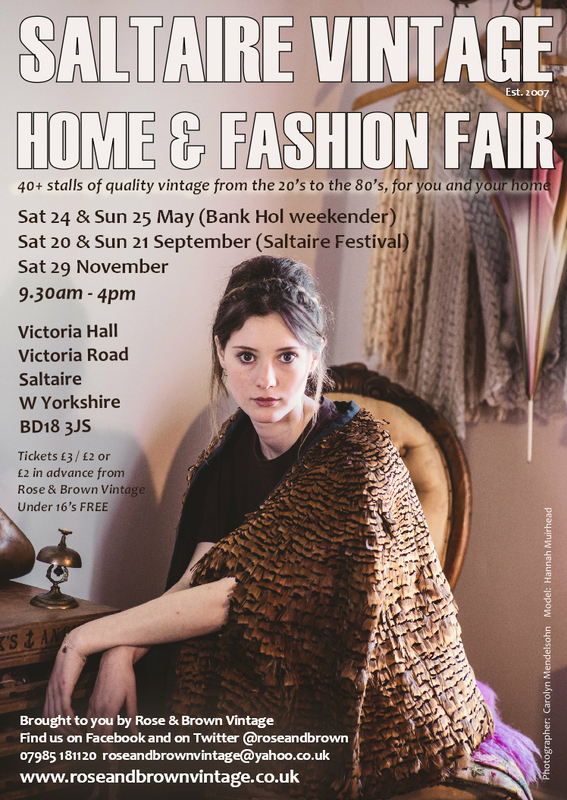 The next Saltaire Vintage Home & Fashion Fair is on Saturday 20 & Sunday 21 September 2014 – during the popular Saltaire Festival, when the village will be full of theatre, music, food, art and more… There will be so much vintage loveliness to choose from at the Fair and both days it takes place from 9.30am – 4pm . 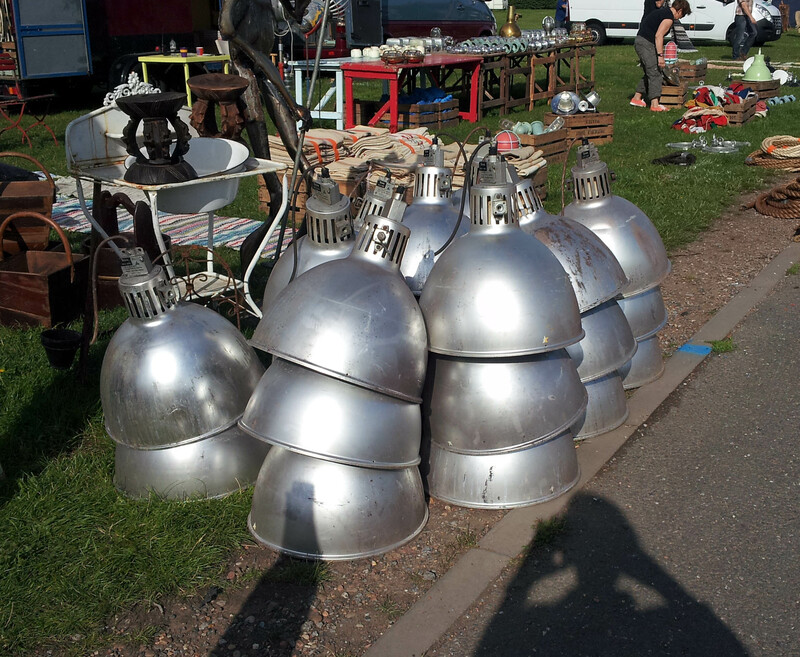 Running regularly since December 2007, we now bring you 40+ stalls of vintage treasures including 50’s frocks and Art Deco clocks, teapots and twinsets, oodles of jewellery, vintage toys and so much more, so that you can spend the whole day browsing through the different eras. 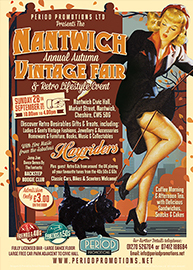 With refreshments served by Interlude Tea Room & Emporium, and music from the 20’s to the 60’s, it’s a day full of vintage goodness! 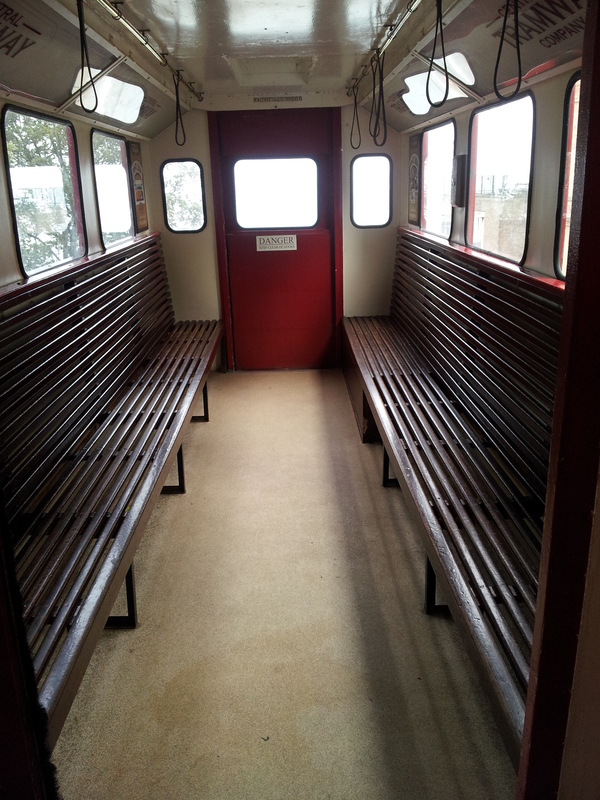 A yearly event from North Norfolk railway Poppy Line where the whole village gets in character, dresses up and steps back in time for an authentic weekend of 40s era entertainment. HAYRIDERS, performing all the best Rock’n’Roll, Jump Jive & Western Swing Hits from the decades. one of the best dance social dance clubs in the North West. 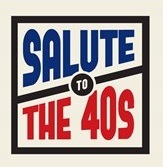 Plus a fantastic line-up of Retro DJ’s from around the UK, playing your favourite tunes from the 40s 50s & 60s. Books, Music & Collectables for all tastes. Classic Cars, Bikes & Scooters Welcome! Coffee Morning & Afternoon Tea, with Delicious Sandwiches, Snacks, Cakes & Treats available throughout the day. Admission only £3.00 for the whole day. Free admission for children under 14yrs, must be accompanied by an adult. Free admission for Veterans & Serving Members of the Armed Services, with Identity Card. I’ve had a couple of nice finds for my kitchen recently. 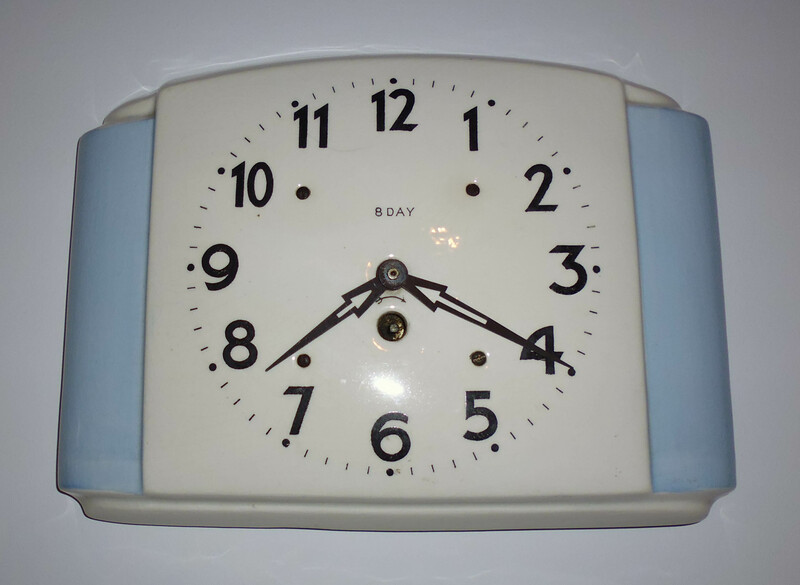 This lovely clock is made of blue and cream glazed pottery. It’s got a Deco vibe, but the mechanism is too recent for it to be a true Deco piece so I think it’s from the fifties. 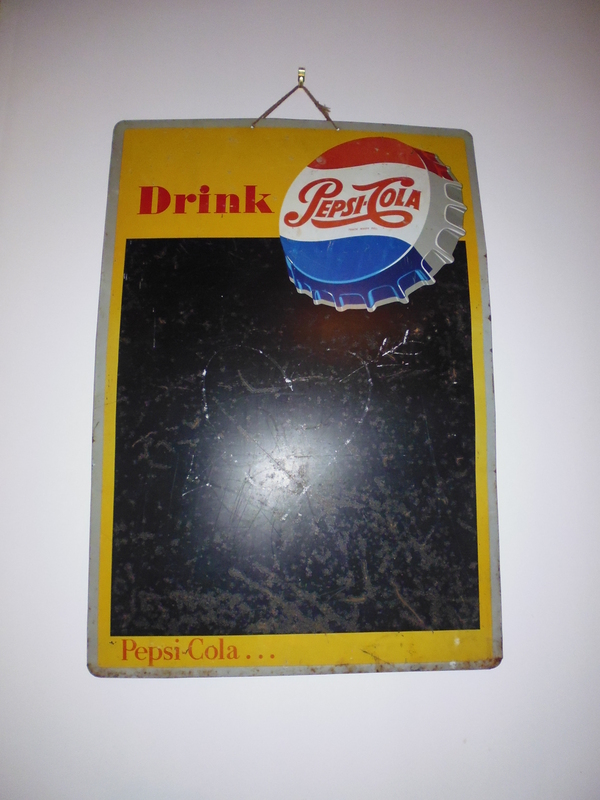 Probably from the sixties, this metal advertising sign is jolly and cheers me up every morning. I’m just a little disappointed that it doesn’t take chalk marks very well so my hope of using it for shopping lists isn’t going to happen! These both came from auctions, and at a reasonable price, so it is still possible to find these little gems. Needless to say, these are staying with me for the foreseeable future. A little late in the posting, but I thought I’d share my trip to the August Antique Fair at Newark. As with my last trip to the fair, I was really lucky with the weather. It rained heavily on the previous day and I really felt for the outdoor stall holders who definitely suffered. But on the Friday I went, the sun came out again and it was a really pleasant day. This threshing sledge would have been pulled over the dried corn or wheat. 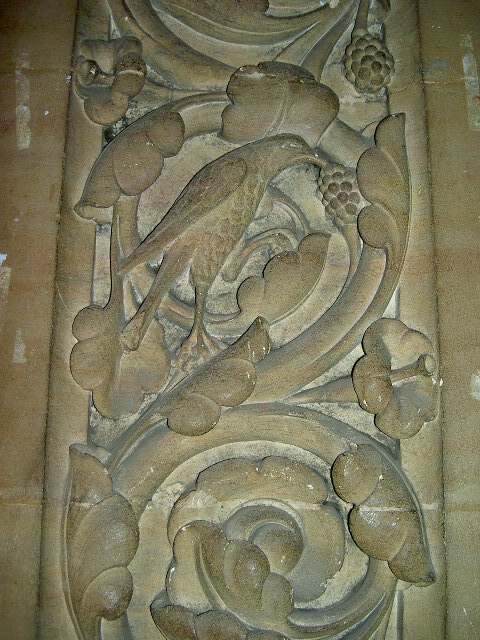 The base is studded with stones to separate the wheat from the chaff. This Dutch company had brought several truck loads of goods. 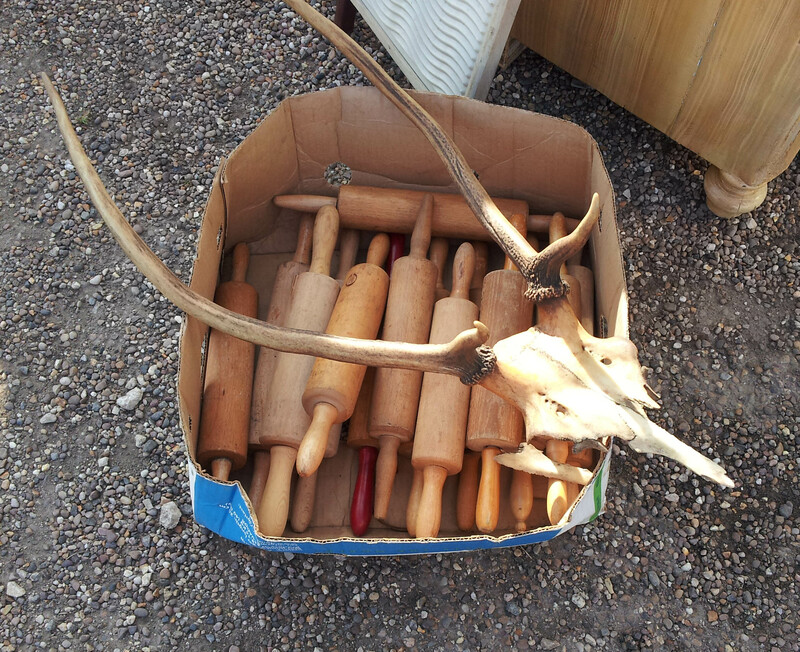 There were random mixtures of items all over the place. 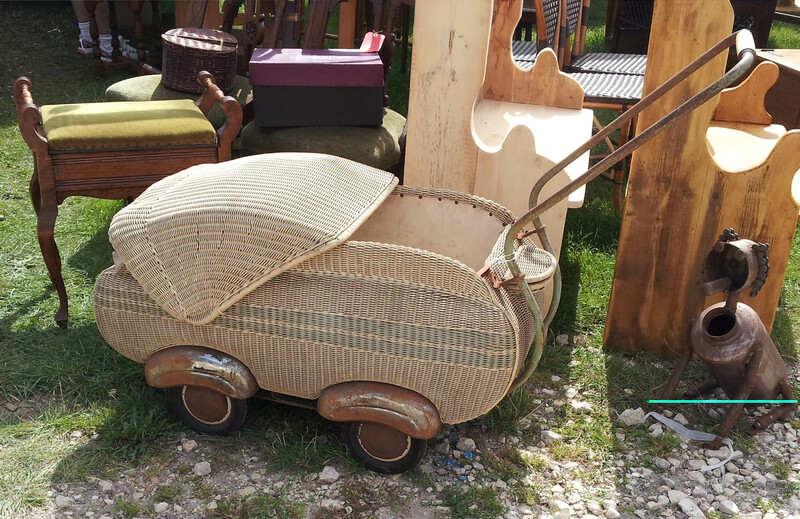 I loved this wicker pram, I’m guessing that it dates from the 50s. 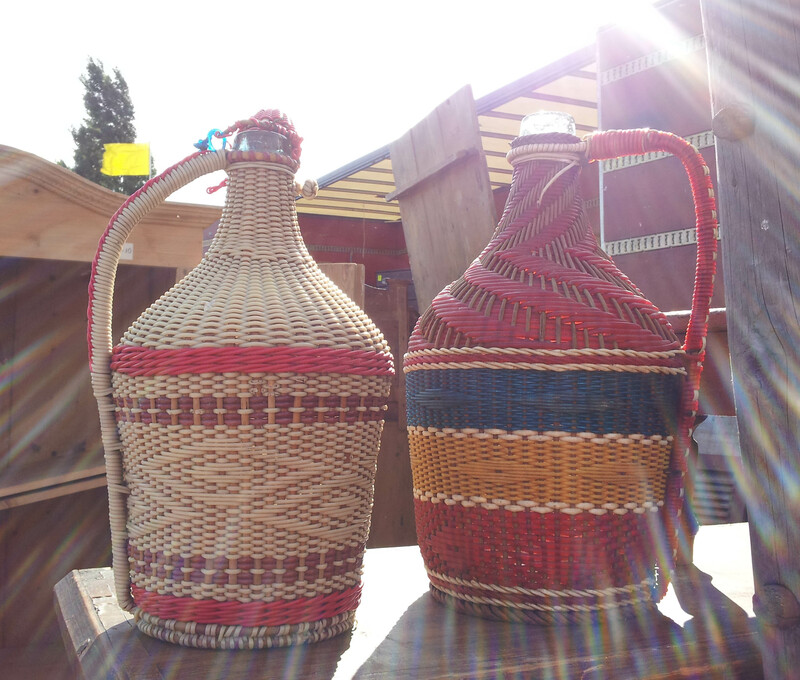 The wicker braiding on these bottles was beautiful. These bikes were probably from a fairground ride. 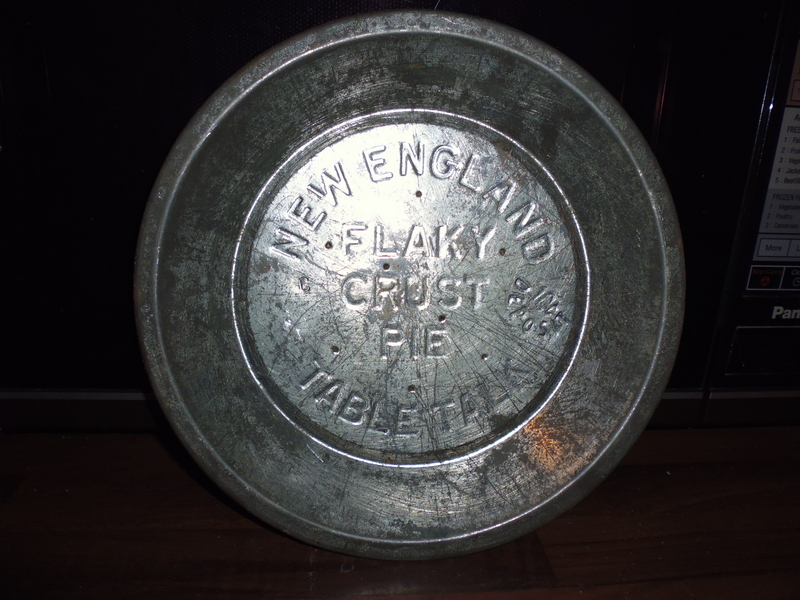 These plates would have been sold with the pie, and carried a deposit to ensure that they were returned to the manufacturers. 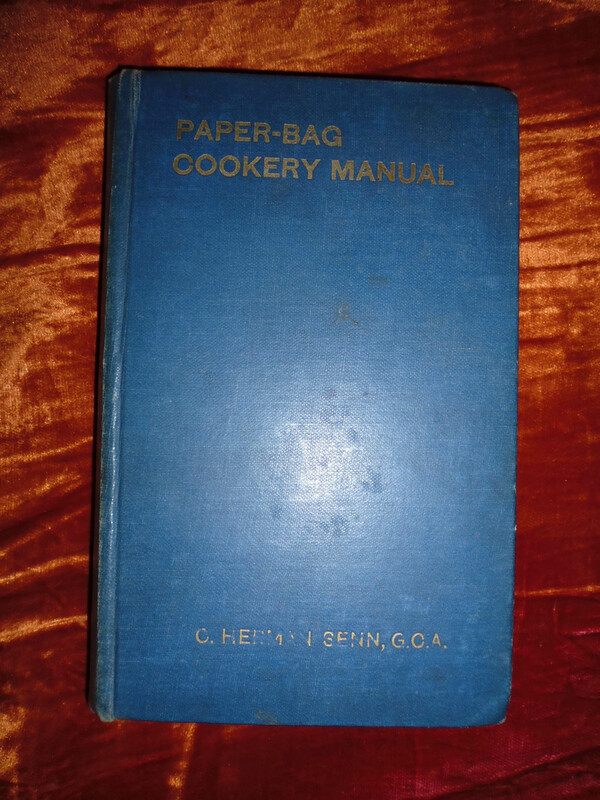 I was intrigued by this cook book dating from 1911, particularly as I’ve just discovered how simple it is to cook vegetables in a roasting bag. I thought that I might be able to use the same bags to try out the recipes in this book. 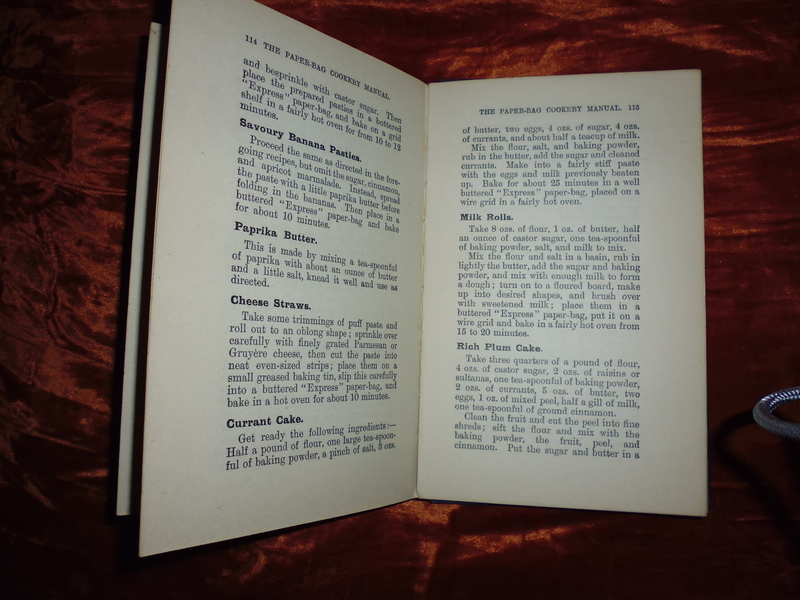 Written by a former Chef at the Reform Club, it has 132 pages of recipes from meat to sweets, so it will keep me out of mischief for a while. 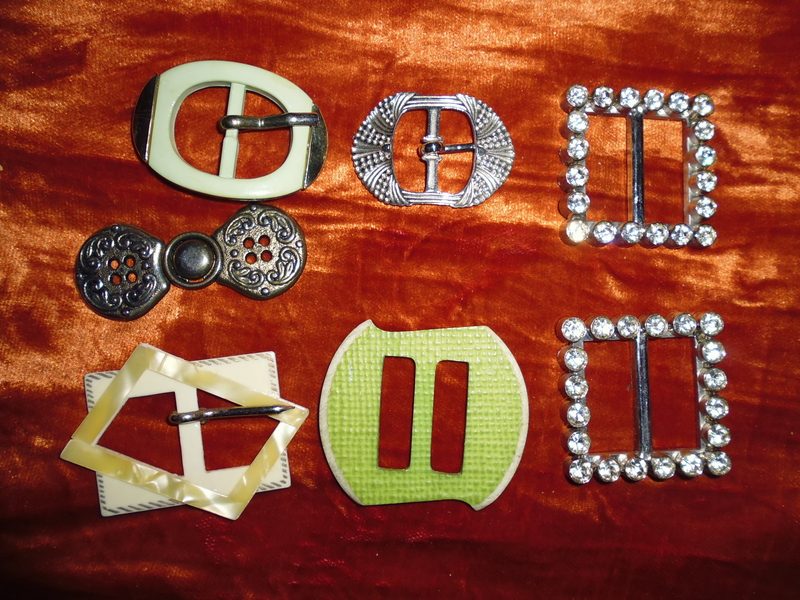 And finally, I snapped up this lovely selection of vintage buckles. I’m not sure what I’ll use them for yet, but I’ll definitely do something. 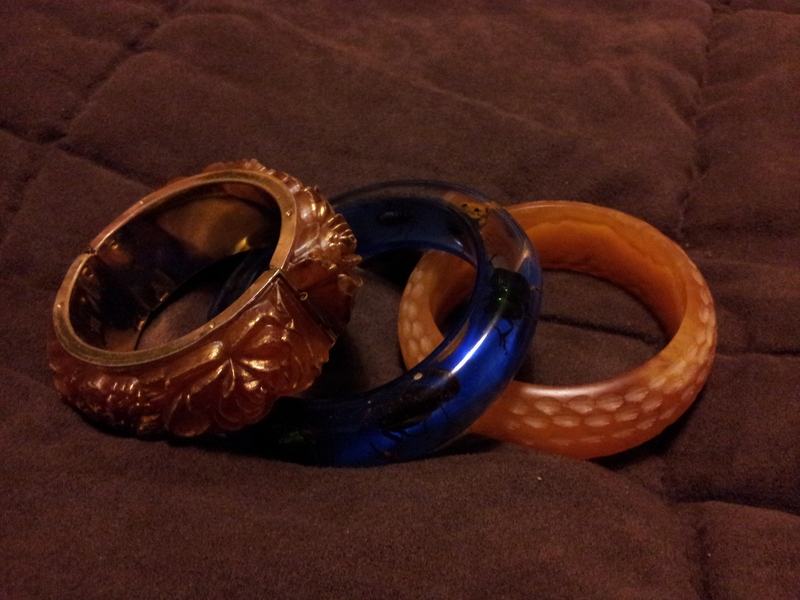 Just a quick post today, to share with you these lovely vintage bangles that I found recently. At only £5 each, I thought that they were a relatively inexpensive way to add a ‘pop’ of colour to a modern outfit. 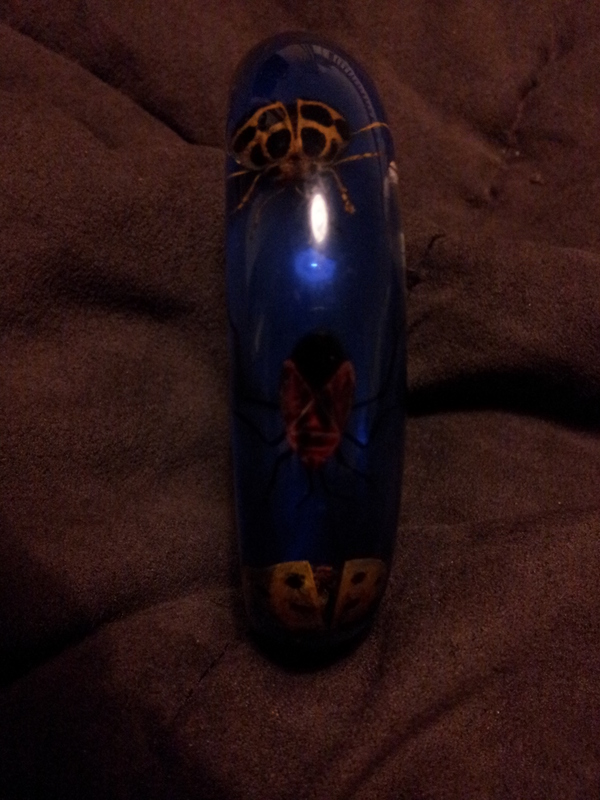 The finish on this one reminds me of beeswax candles – I think it’s made of resin. 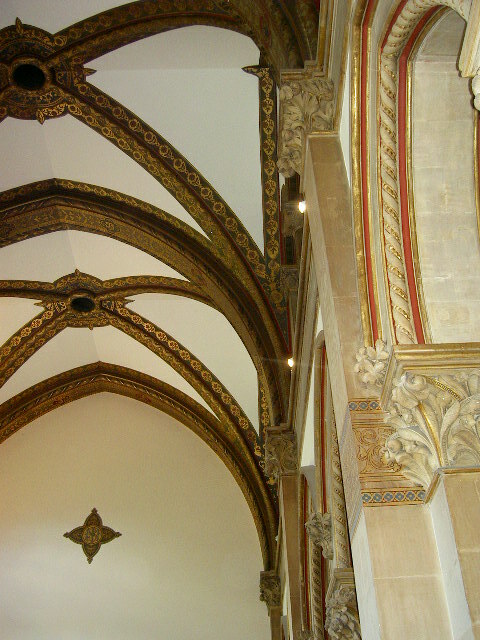 As well as the dimples on the surface, the variations in colour mean it looks different whichever way you look at it. 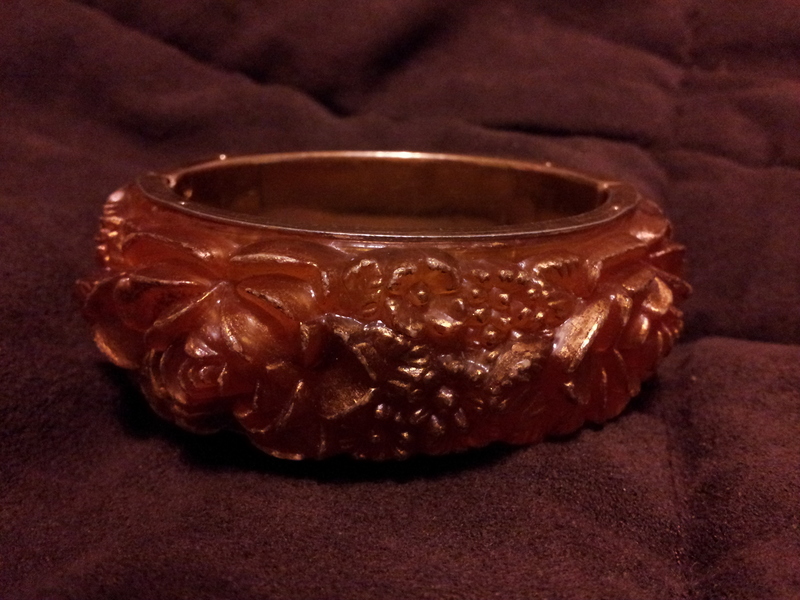 This bangle is a bit more sophisticated, with ‘gilding’ to the edges of the flower petals. 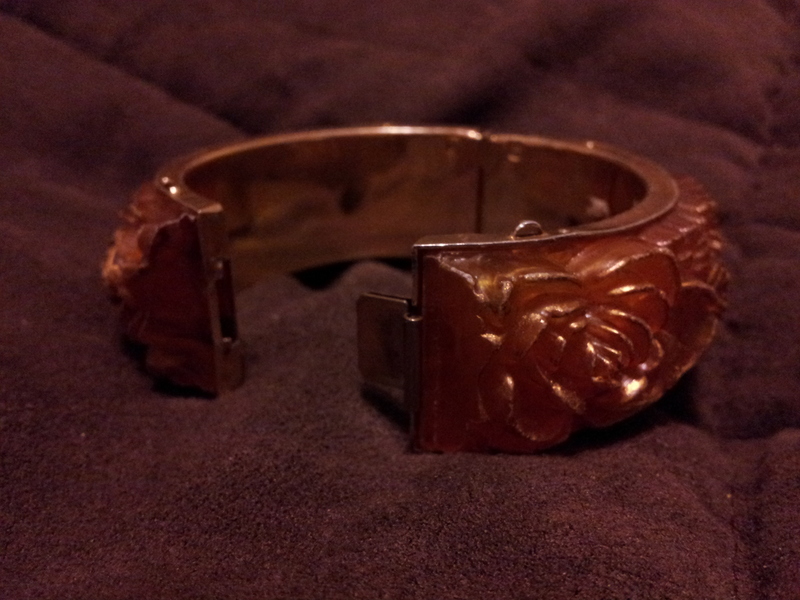 It’s lined with a thin brassy material and has a clasp and hinge to open it so that it fits closely around the wrist. Sadly, the hinge is a bit delicate so I suspect this will be the least worn of the three. 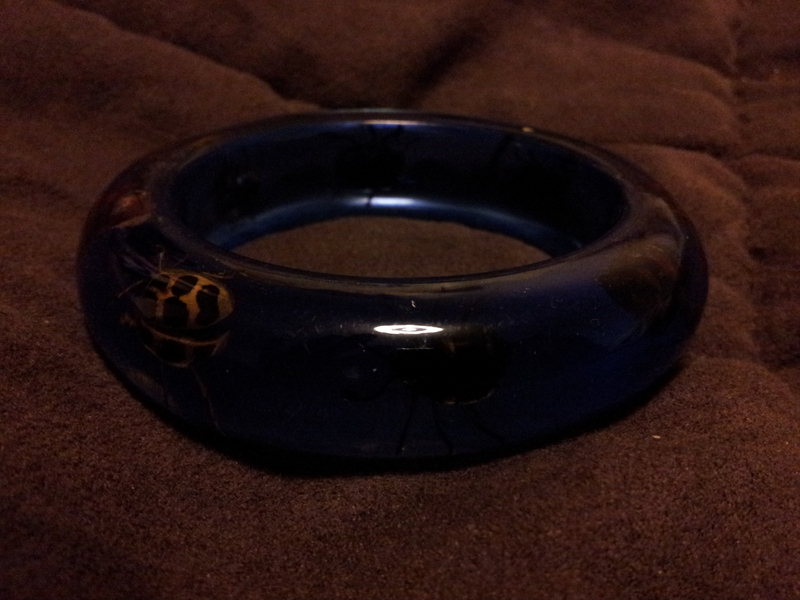 I have to confess that, although many people would find this a bit creepy, I love this bug bangle. 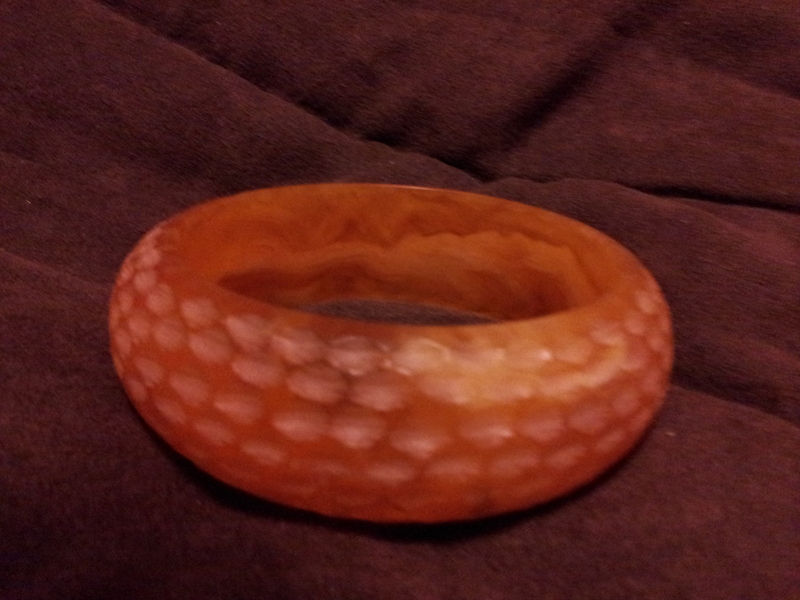 It’s made from clear resin, and you can see from the irregular outline of the bangle that it wasn’t made recently. 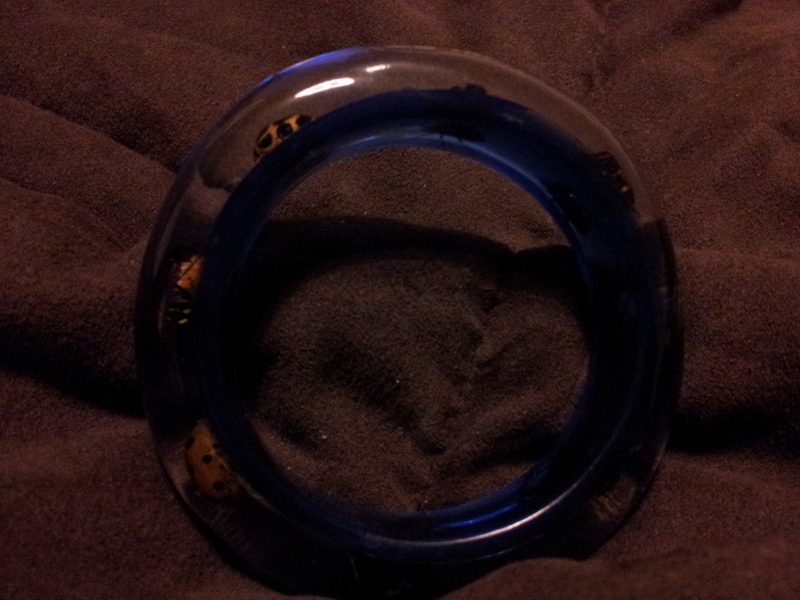 The resin is tinted blue around the wrist side and clear elsewhere. This means that when you look at the bangle edge on, it looks blue. 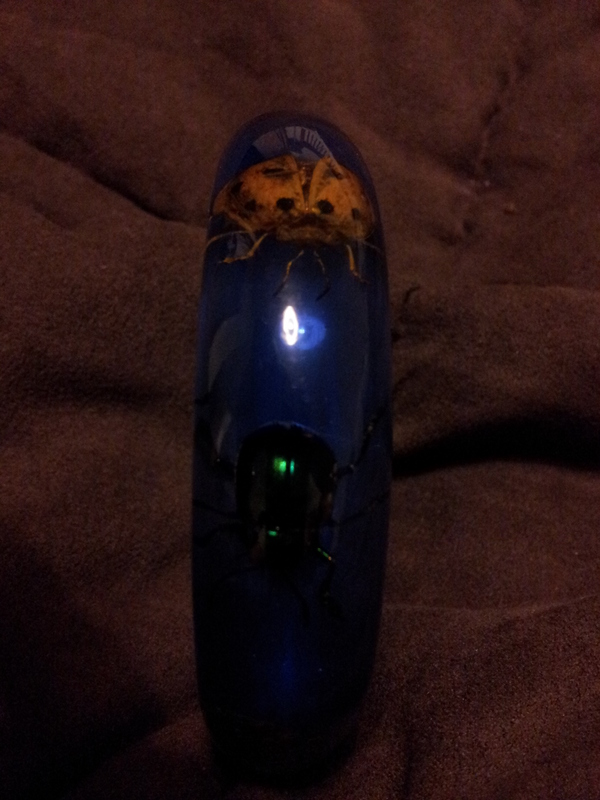 Set within the clear resin are a series of ‘bugs’ – ladybirds, beetles and even a small scorpion! It wouldn’t suit everyone, but I think it’s great, and I’m enjoying wearing it to jazz up a navy work suit. It’s a great way to combine vintage and modern in a traditional workplace. 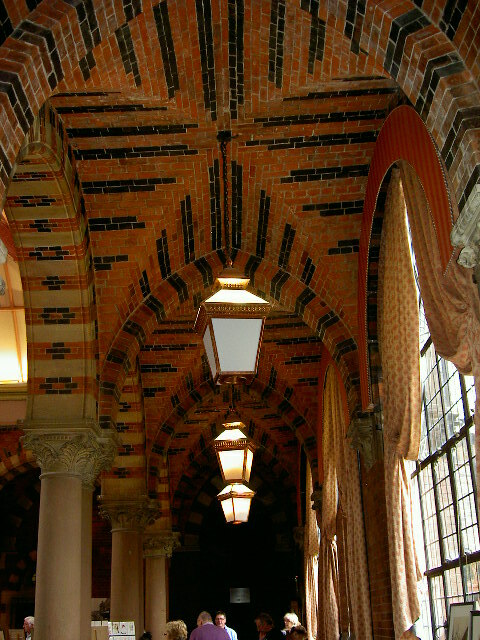 On Sunday, I went to an Art Deco and later British Style fair at Kelham Hall. This was going to be a blog about the great vintage items I saw on sale there, but sadly photography was discouraged and I can’t wax lyrical without showing you the pictures. 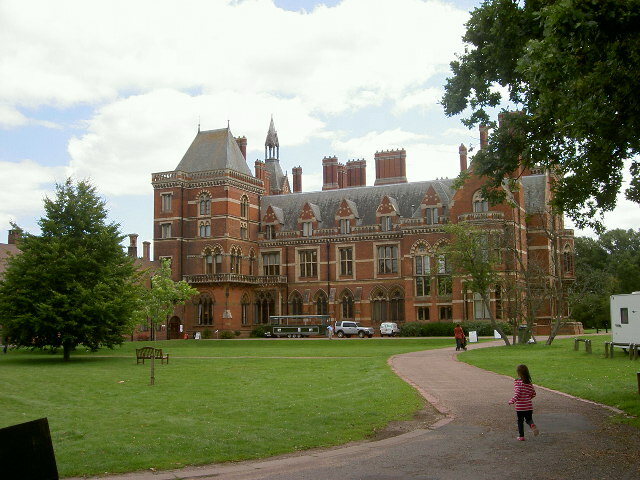 Instead, as Kelham Hall is such an amazing place, I thought I would share the place with you. 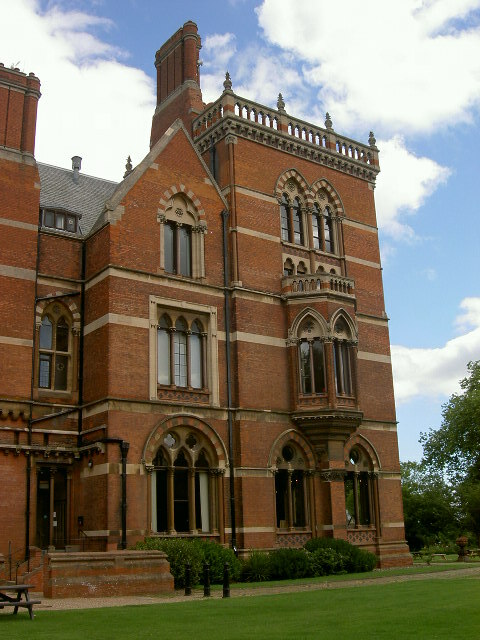 Kelham Hall as it stands today was built by a Victorian brewing magnate. 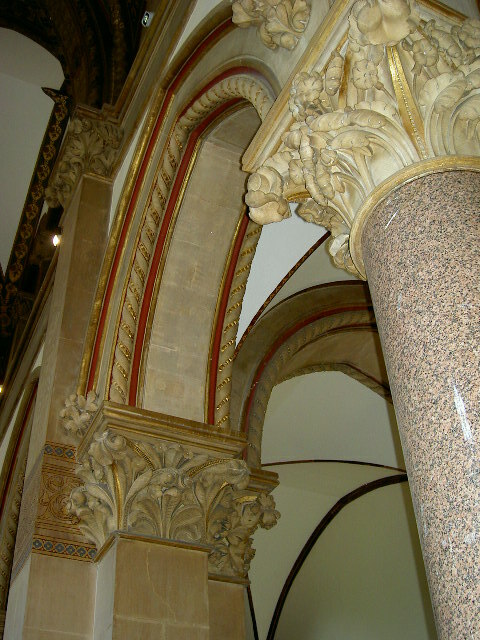 The architect was Gilbert Scott, who was also responsible for the Albert Memorial and St Pancreas. Apparently, the plans for the original building were even grander, but the money ran out before the towers could be built! 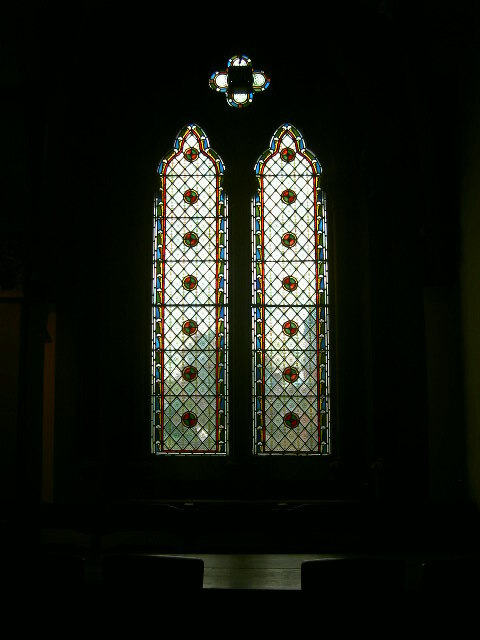 In the early 1900s, the Hall was bought by a monastic order who added an extension in the prevailing Arts and Crafts style to serve as a seminary. 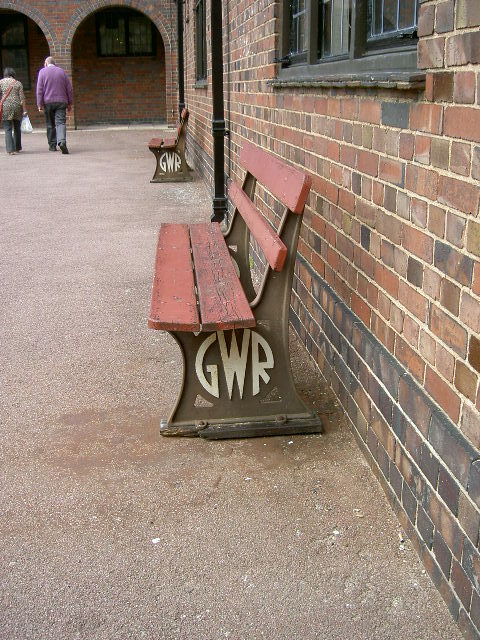 Love these benches – originally from the Great Western Railway. Given that this area is served by the East Midlands Railway, I wonder how these got here? 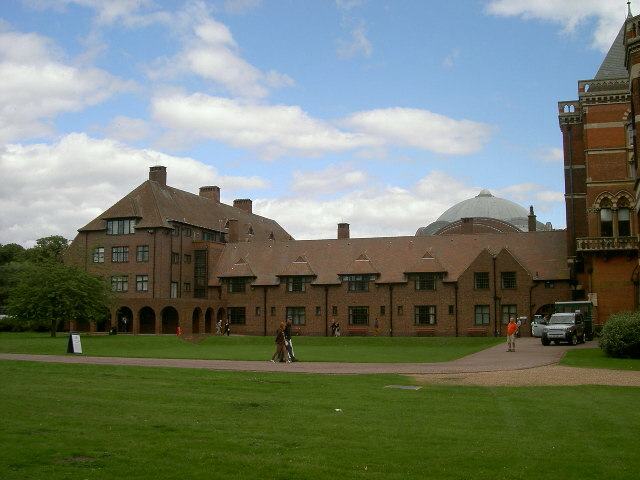 At the moment, Kelham Hall is used as the local Council’s headquarters, but is used to host weddings and events such as the Deco Fair. Check out their website if you’d like to find out more. I’ve been so busy exploring the area around my new hometown I have neglected to look for the vintage opportunities closer to home. Newark does well for antique shops – which may be something to do with the famous Antiques Fair I blogged about here – but it’s not so easy to find vintage. Anyway, as I didn’t want to stray too far from home in this gorgeous weather, I decided to stay close and explore what Newark had to offer. Tucked around the back of a tattoo parlour, I found a decommissioned church which is now home to the Newark Antiques Centre. This varied centre rents a series of ‘booths’ to independent traders, guaranteeing a wide range of items over the two floors. 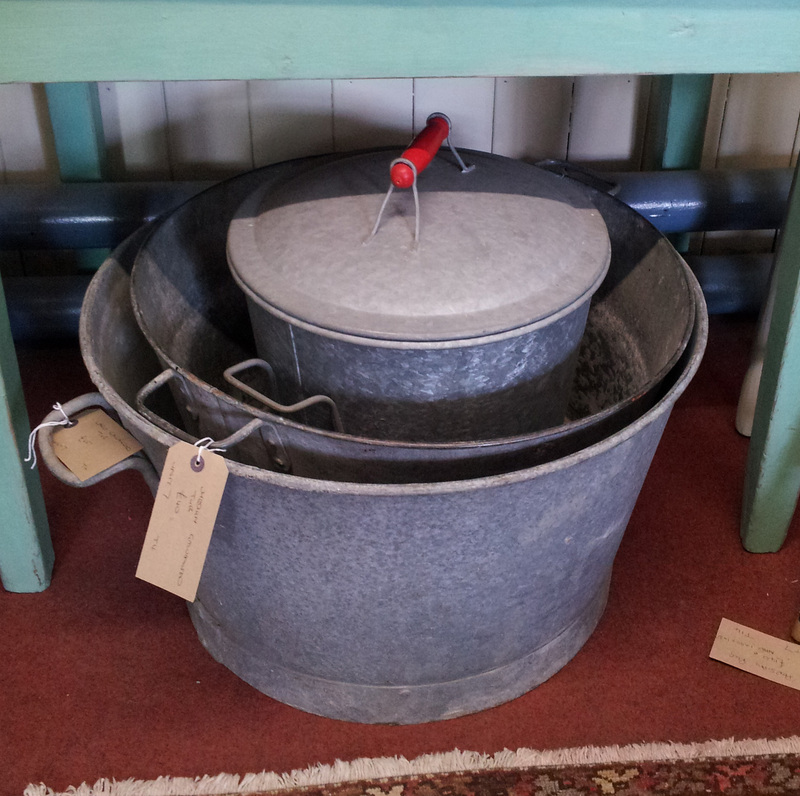 A nice collection of galvanised tin washtubs. 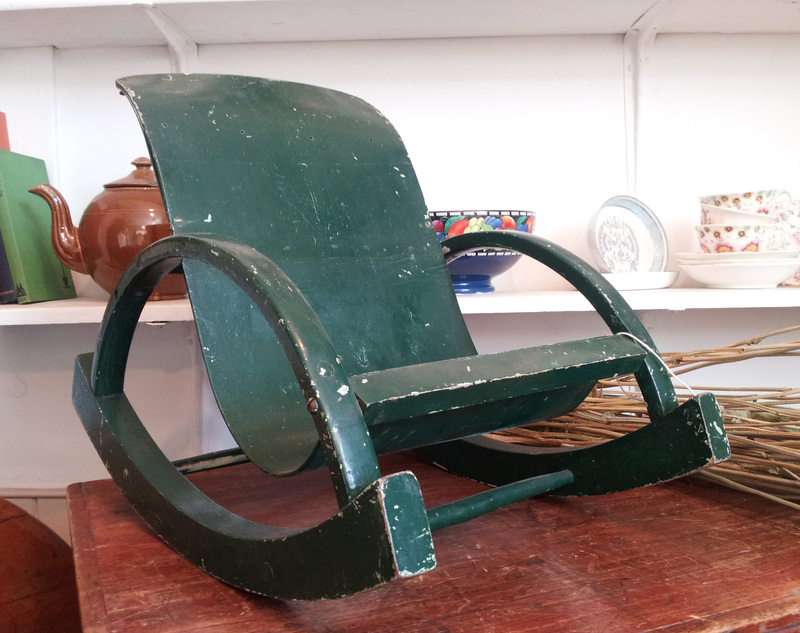 Completely the wrong subject for our current baking hot weather, but I love the painted detail on this sledge. 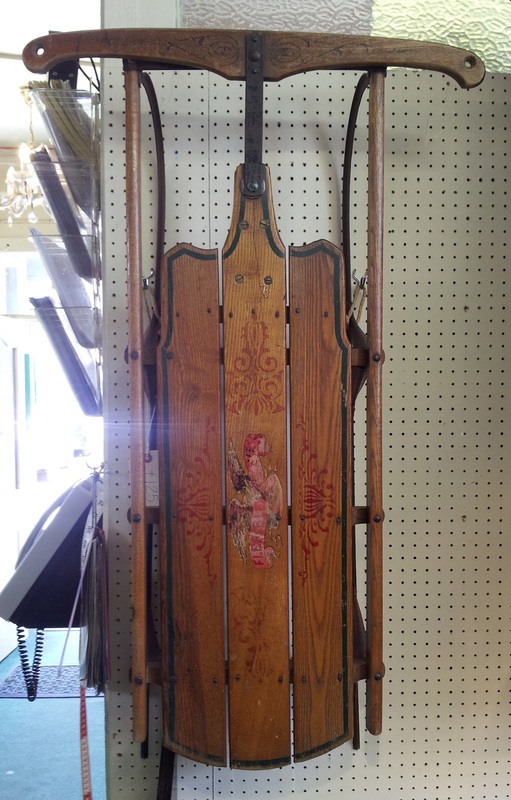 Because of the steering mechanism and the painting, I am guessing that this is probably from Austria. 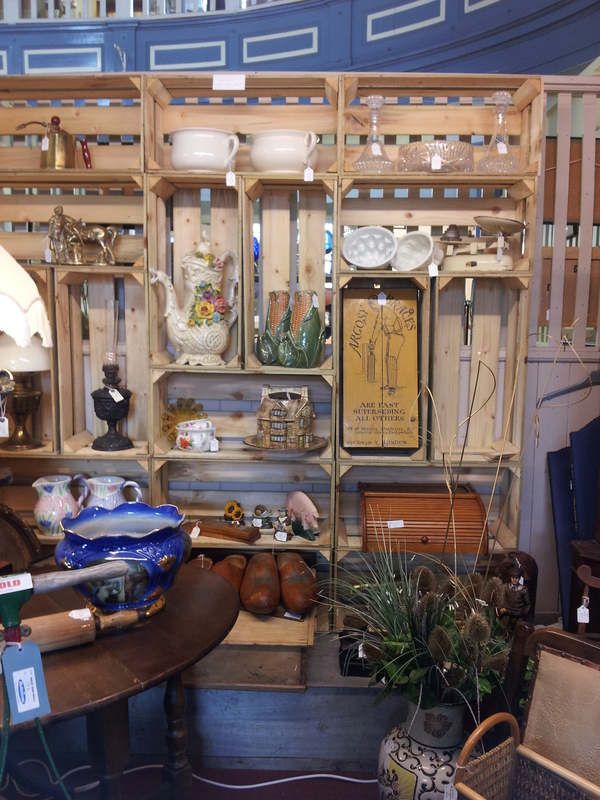 I really liked this idea of a shelving unit made from vintage wooden boxes. 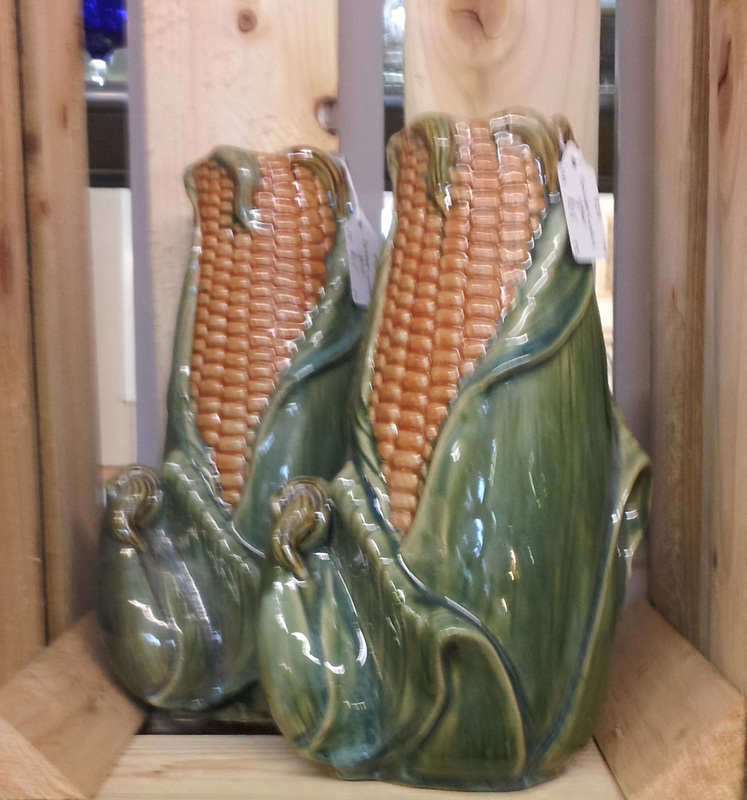 Just the thing to display your vintage treasures – although maybe not these novelty corn cob vases! 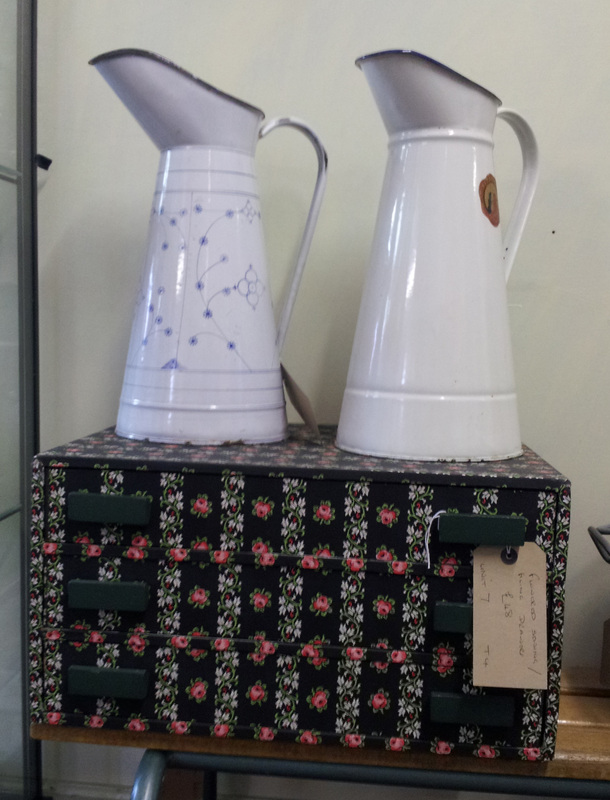 I liked these enamel jugs – I could have a serious enamel habit if my purse was deep enough, and I thought that the set of drawers (made of cardboard covered with vintage wallpaper) were also cute. 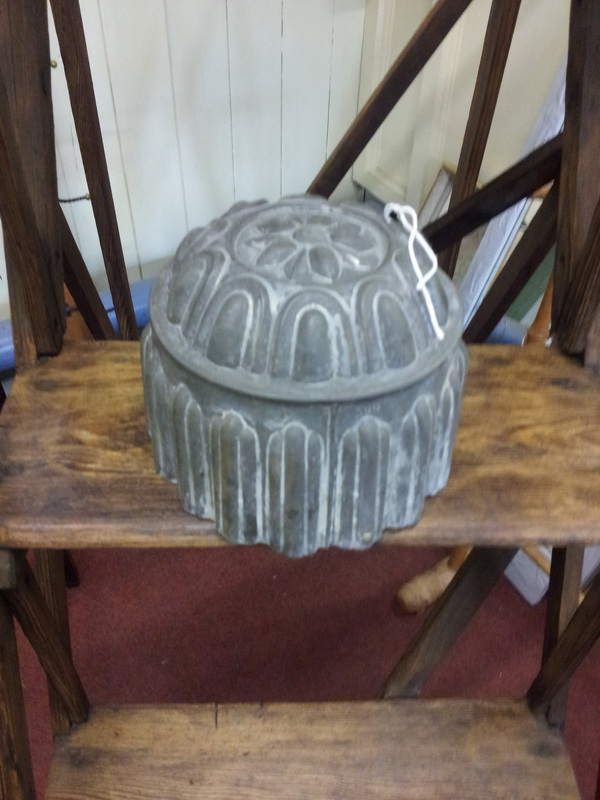 I like the contrast of the metal jelly mould on an old set of wooden steps. 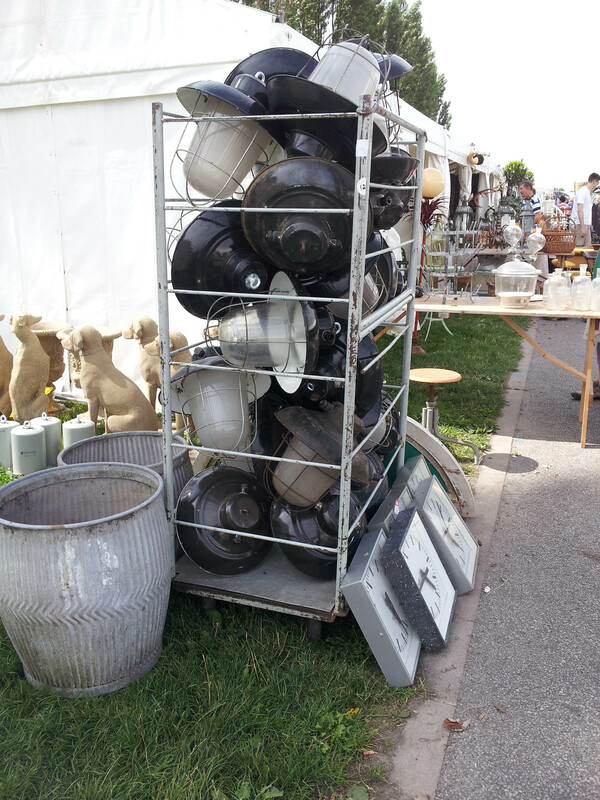 It would be fair to say that although there wasn’t any dedicated vintage stands, there was enough vintage items spread across the stalls to make a vintage visit worthwhile. There is also an interesting looking café that I didn’t have time to explore, so now I have found it, I shall certainly be back to visit on a regular basis.